University Schools is a tuition free K–12 public charter school located in Greeley School District 6 in Greeley, Colorado. The tradition of developing better ways to teach our children is at the heart of University Schools. University Schools has been a leader in education for more than a century. At University Schools, we believe that children learn best in a safe, nurturing, and supportive environment. Our students enjoy a student-led, teacher-guided educational experience. At University High School, we focus on creating a student-centered learning program. We prepare our students for success beyond school, as they develop personal and academic plans and portfolios and participate in community service projects. We invite you to take a look around our website to see what we have to offer for your child. I hope this newsletter finds you well and that you enjoyed Spring Break! Because we have four candidates running for three open positions on the Board of Governors, the Board approved the ballot at their regularly scheduled meeting on March 6, 2019. The ballots will be mailed on April 2 and we ask that the ballots be returned by mail or dropped off at the Main Building Office by 4:00 pm on April 16. You may notice that your ballot is numbered. It is not to identify voters, but to assure that only original ballots are submitted. The ballots will be counted on April 16 and the election results will be certified on April 17 at a special Board meeting. The newly elected Board members will begin their terms in July. We sincerely appreciate you taking the time to vote in this election. 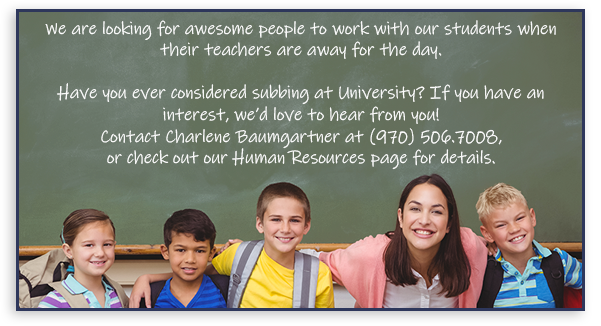 Also, as we have for the last few years, we have contracted with the University of Northern Colorado Research Lab to send out a Parent Survey the first part of May. The survey results help address concerns or affirm some of the procedures we have in place. Your feedback is important to us and we hope to make improvements based on your comments. Our schools’ budget committee, made up of staff and administrators from each level – elementary, middle and high as well as a School Accountability member and a member approved by the Board of Governors, will begin meeting in April to submit a proposed budget to the Board of Governors. Our budget will be based on funding approved by the State Legislature and we hope to have a budget recommendation to the Board of Governors by the May 8 meeting. Thank you for all you do to support our students and staff! The Board of Governors’ election will be April 16, 2019. Nomination and background check forms can be picked up in the Main office beginning February 11, 2019. All forms must be returned to the Main office or sent via email by March 6, 2019, at 4:00 p.m. Three positions will be elected. Three current members are eligible for reelection. The nine Board Members who are not the Faculty/Staff Representative shall be elected by a vote of the majority or plurality of the parents or guardians of students attending University Schools. Only one parent or guardian of the same child may serve on the Board at the same time. North Range Behavioral Health Suicide Education and Support Services’ Project Coordinator Kimberly Pratt will host Question, Persuade, Refer (QPR) training for University parents on Tuesday, April 30 from 6:00 p.m. to 7:30 p.m. in the elementary/high school library. UHS junior Madisyn Gentry earned second place in the original oratory event at the National Qualifying Tournament for National Speech and Debate Association's (NSDA) Rocky Mountain North District. Thank you to those who participated in the Blended Learning survey.